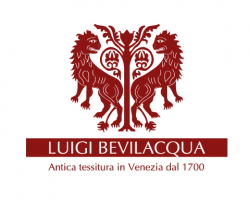 The Tessitura Luigi Bevilacqua, led by the Bevilacqua family, carries on one of Venice’s most ancient traditions. And it does it using original 18th-century looms. As well as mechanical production. Their efforts to improve the brand’s renown will therefore give a major boost to this process, though our fabrics will still be niche products, a feature which has always been an identifying mark of Bevilacqua’s collections.